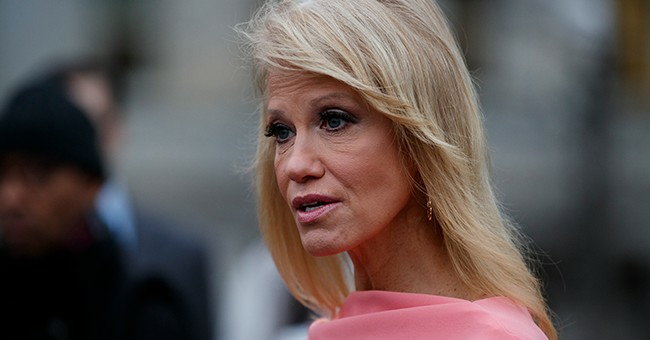 During a press conference on Monday, White House advisor Kellyanne Conway spoke to the media about the Attorney General William Barr's summary of Special Counsel Robert Mueller's report. One question came up about how we know, for a fact, that no obstruction took place. "How do you reach that conclusion that there was no obstruction when it's still kind of an open-ended question?" one reporter asked. "Well, I read the quotes 'no obstructive conduct' so, clearly, they've concluded no obstructive conduct. I'll take that verses 'Collusion! Collusion! Watergate! Watergate!' of the last two years. So I sort of like our odds today," Conway responded. "But, however, the failure to find obstruction means that no obstruction was written into the report for a reason. But let's not forget where that came from. That came from leaks and accusations, that I believe, started with Jim Comey leaks to lots of folks, saying that he specifically leaked information hoping that it would draw an investigation." "I know he's out in the red woods or...geopolitical, geological time. He's doing something, aggrandizing himself but maybe we'll have to hear from him again," Conway said, referencing one of the former FBI Director's Sunday tweets. "Maybe he should go get a lawyer. Maybe he should be brought in. Maybe you shouldn't give him the heroes welcome and the phony book tour. Maybe he should be asked again, what happened, under oath. But we'll see," Conway said. During a Monday morning press conference, Senate Judiciary Committee Chairman Lindsey Graham vowed to "get answers" from intelligence leaders. We know one of those figures he wants to question is Comey, based on a "See you soon," response he provided the former FBI Director.
? ?KELLYANNE CONWAY TO JIM COMEY?? "Jim Comey - should go get a lawyer. He should be brought in."